Other information necessary to provide the UTB Site, for example we may access your location if you give us your consent. companies in the Chelsea FC Group where you have expressed an interest in UTB or purchased a product which includes or involves UTB. We may combine the information collected via the UTB Site with information we collect from you offline, for the purposes of better understanding our customers and to improve our marketing, as well as for security purposes. To fulfil your purchase, order or request (for example, when you buy a ticket to an event through the UTB Site). To maintain your account on the UTB Site and offer you a personalised experience on the UTB Site. To improve and maintain the UTB Site, and monitor its usage. For market research, e.g. we may contact you for your opinions and comments. To investigate breaches of our contracts, policies or Terms and Conditions. Because we have obtained your consent (e.g. where you contact us with a query, where you add optional information to your account, or if you consent to receive marketing from us). You are free to withdraw your consent at any time. Because it is in our legitimate interests in operating our business, for security purposes, to protect our staff, premises and reputation), for fraud prevention and to operate and promote UTB. For example, we are always seeking to engage more with our fans and users of the UTB Site, and we use information about you to tailor your view of the UTB Site to make them more relevant to you, the messages we send to you. We also combine information we collect about you with aggregated information about our fans, to increase our understanding of our fans and to promote UTB. Depending on your marketing preferences, UTB may use your Personal Information to send you marketing messages by email, phone, SMS or post. Some of these messages may be tailored to you, based on your online profile, your previous browsing or purchase activity, and other information we hold about you. If you no longer want to receive marketing communications from us (or would like to opt back in! ), you can change your preferences at any time by contacting us via any of the methods given at the in the ‘Contact us’ section at the end of this Policy, or by using the ‘unsubscribe’ mechanism in the promotional message or updating your contact preferences in your account. If you unsubscribe from marketing, please note we may still contact you with service messages from time to time (e.g. ticket confirmations, and information about your legal rights). Once you unsubscribe, you may continue to receive marketing messages for a few days while we action your unsubscribe request. You may also see adverts for UTB on third party websites, including on social media. These ads may be tailored to you using cookies (which track your web activity, so enable us to serve ads to customers who have visited the UTB Site). Where you see an ad on social media, this may be because we have engaged the social network to show adverts to our customers, or users who match the demographic profile of our customers. In some cases, this may involve sharing your email address with the social network. If you no longer want to see tailored ads you can change your cookie and privacy settings on your browser and these third party websites. With the other companies in the Chelsea FC group, as necessary to operate our business as well as for marketing purposes to improve our customer insights. For example, we may receive Personal Information from the hotels at the Stamford Bridge site, or the Chelsea Health Club and Spa, or companies within the Chelsea FC Group that operate our marketing activities, stadium tour and museum business, and matchday and non-matchday hospitality business, and combine it with the Personal Information which we hold about you, to better tailor our marketing to you. Where is your Personal Information stored, and how long is it kept? Our servers are located in the United Kingdom. However, UTB uses service providers based around the world. Consequently, your Personal Information may be processed in countries outside of Europe, including in countries where the local laws do not provide the same level of data protection as those in Europe. If we transfer Personal Information outside the European Economic Area we will, as required by applicable law, ensure that your privacy rights are adequately protected by appropriate safeguards. These safeguards may include the EU’s standard contractual clauses or the EU-US Privacy Shield. Please contact us if you would like more information about these safeguards. We will keep your Personal Information for as long as we need it for the purposes set out above, and so this period will vary depending on your interactions with us and the nature of the Personal Information. For example, where you have bought a ticket or merchandise from us, we will keep a record of your purchase for the period necessary for invoicing, tax and warranty purposes. We may also keep a record of correspondence with you (for example if you have made a complaint) for as long as is necessary to protect us from a legal claim. Where we no longer have a need to keep your information, we delete or anonymise the relevant information. Please note that where you unsubscribe from our marketing communications, we will keep a record of your email address and/or phone number (as applicable) to ensure we do not send you marketing emails in future. Our products and services are not intended for people under the age of 18. Like other websites, information and data on the UTB Site may be automatically collected through cookies and similar technologies. Cookies are small text files that a website can use to recognise repeat users. Cookies (and technologies like them) allow us to understand how our visitors navigate the UTB Site on each visit and remember you if you return to the UTB Site. We use this information to improve the UTB Site, tailor their contents, and to target appropriate advertising. Strictly necessary cookies: These cookies are essential to enable you to navigate around the website securely and to provide you with services you have specifically requested. For instance, they help ensure that payments are processed securely. Online behavioural cookies: These cookies enable us to collect information about your online behaviour, such as your browsing history. For instance, they help us tailor the advertising we show you to your interests. If you contact us by telephone, we may monitor or record the call for security purposes and to improve the quality of services that we provide to you. The UTB Site may include links to websites operated by third parties. 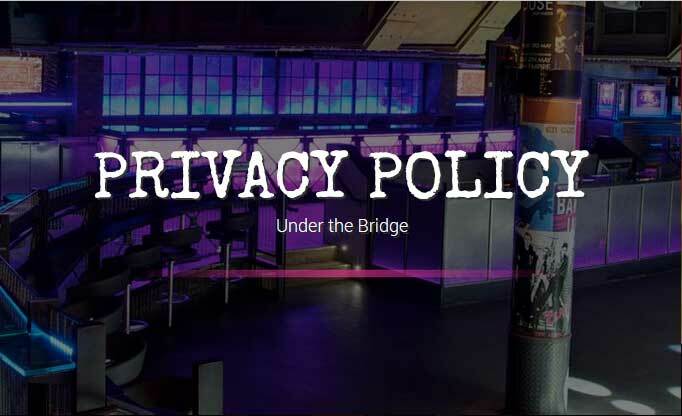 These linked sites have separate and independent privacy policies. We therefore have no responsibility or liability for the content or activities of these linked sites. However, we do seek to protect the integrity of our site and welcome any feedback about these linked sites (including if a specific link does not work) by email or in writing via the contact details given below. You also have the right to object to your Personal Information being used for certain purposes, including to send you marketing. See section 4 (‘How do we use your Personal Information for marketing & advertising?) for more details of how to opt out of marketing. wW will comply with any requests to exercise your rights in accordance with applicable law. Please be aware, however, that there are a number of limitations to these rights, and there may be circumstances where we are not able to comply with your request. To make any requests regarding your Personal Information, or if you have any questions or concerns regarding your Personal Information, you should contact us using the details below. You are also entitled to contact the UK Information Commissioner’s Office if you have any concerns.